I’ve been fascinated with hot air balloons for as long as I can remember. My dad used to take me to a field just down the road from our house where balloonists would land and I always wanted a ride. When I moved to Las Vegas, balloons would lift off near our apartment in Summerlin and I always thought it would be romantic to take a ride over my beloved Las Vegas. So romantic in fact, Tim and I decided to get married in a hot air balloon. Unfortunately, it was too windy that day and we never got to lift off for our flight. 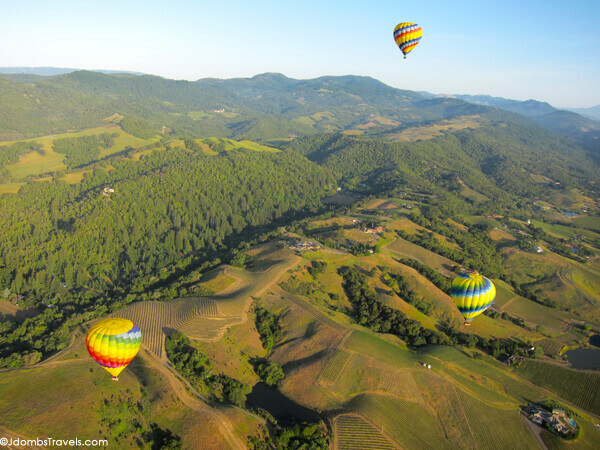 Just a little more than 10 years later, I finally had my very first hot air balloon flight – sans Tim – ballooning over Napa Valley. 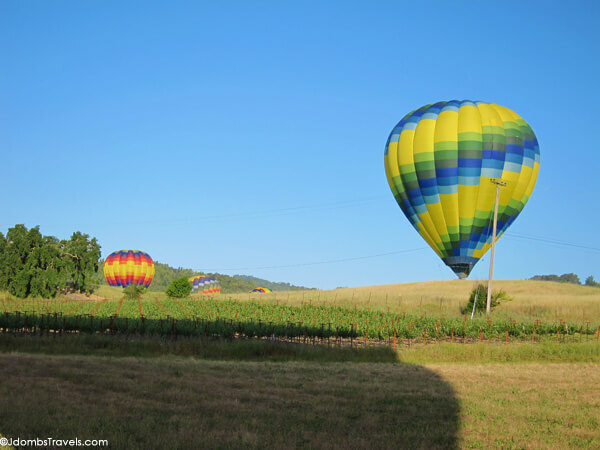 I groaned as the alarm rang at 4:30am and thought “This better be worth it!” I had arrived in Napa Valley late the night before and thankfully I was staying at the Napa Valley Marriott, where Balloons Above the Valley meets all its passengers. I only had to stumble down to the lobby, where freshly brewed Starbucks coffee and pastries were waiting. After a few minutes wait while everyone got checked in, we piled into several vans to drive the couple miles to the launch site. Either the coffee kicked in, everyone was just really excited, or a little combination of both, but there was definitely an electric buzz in the air as we arrived at the launch site where our four balloons were already being inflated. We stood amongst vineyards, the grapes glistening with early morning dew, and excitedly watched as the balloons took form. Since it was already dark when I arrived in Napa Valley the night before, I got my first glimpse of California wine country with a birds-eye-view ballooning over Napa Valley. The breeze gently lifted us, with the help of the burners, and we glided over wine estates as the sun rose. Our very knowledgeable pilot pointed out vineyards below, easily ticking them off by name, including Grgich Hills which I visited with the Napa Valley Wine Train. It was actually such an incredibly clear morning with such gentle winds that we could easily see all the way to the Bay. I counted at least 11 other balloons in the sky with us. Shuttled back to the Napa Valley Marriott, a champagne brunch fit for a king awaited us. Chandon California Brut Classic was served and could be made into Mimosas, perfect for brunch at just 8am. Mimosas went wonderfully with the waffle bar, chef’s scramble with market meats and veggies, and the delicious chicken apple sausages. The Brut Classic is made from Champagne varieties of Chardonnay, Pinot Noir and Pinot Meunier and has tastes and aromas of apples and pears. The Brut Classic is blended with 10-20% percent Reserve wines from prior harvests to ensure the highest quality. It retails for $22 per bottle and can be purchased at Domaine Chandon or wine shops around Napa Valley. Chandon is located at 1 California Drive, Yountville and the Visitor’s Center is open from 10am – 5pm daily. Tasting start at $18 per person. Note that the tasting room is restricted to adults 21 years of age and older, but children may visit with an adult on the outdoor terrace. Thank you to Balloons Above the Valley for hosting me on my very first hot air balloon ride. As always, all opinions are my own and in now one influenced by glasses of sparkling wine at 8am. I am so enjoying your blog. 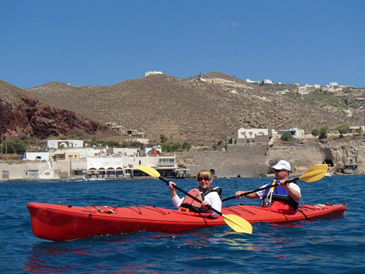 You have had the most amazing travel experiences! I will also be based in Italy from July. Thanks so much, Judi! 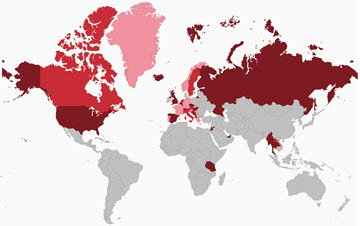 Where in Italy will you be based? I don’t know if I would actually ever dare do this! I’d be too shakey to enjoy it! I can’t believe it! With some of the crazy things I’ve seen you do like go in that mine, hot air ballooning is not what I would expect to give you the shakes! I have a fear of heights – especially in things that don’t feel secure! Hi Jennifer. I will be in Castel Rigone a hilltop village on the banks of Lake Trasimeno. Near Passignano . Do you know it? Sounds lovely, Judi! I’m not familiar with the town but love that area! Gorgeous view!! We’re planning to head to Napa to view the foliage this fall – I bet a baloon ride would be an amazing way to see all of the colors! I bet Napa will be gorgeous in the fall and I am sure a hot air balloon ride would be an amazing way to view the colors from above!